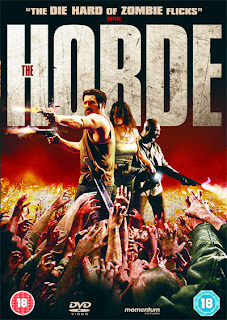 Today, the 2009 French film The Horde. When a police officer is killed by a gang of criminals, his friends in the department decide to take the criminals down not through by-the-book law enforcement but through an off duty exaction of vengeance. The gang's base of operations is located on the upper floor of a largely abandoned apartment building, so the officers arm themselves and infiltrate the rundown structure. The cops are out for a bloodbath, and they get it, but not quite in the way they intended. Their raid doesn't go well at all, the criminals quickly get the upper hand, the cops are captured and prepared for execution... And we're only fourteen minutes into the movie. That's when strange noises start echoing through the night. Screams, gunshots. A dog belonging to one of the gang's lookouts runs off into the darkness and gets hurt by someone or something. Explosions go off in the distance, shadowy figures move through the courtyard, there are odd sounds of things walking the halls. Twenty minutes in, The Horde officially becomes a zombie movie, as the characters realize the apartment building has become overrun with ravenous, strong, quick-moving undead creatures with a taste for human flesh. This problem is enough to get the cops and criminals to put their differences aside for a while, forming a tenuous alliance so they can attempt to get out of the situation alive. Along the way, the unlikely team befriends a character who seems to be a favorite among viewers, a mentally unbalanced, racist old man. The group battles their way through the building's halls and rooms, expending copious amounts of ammunition and engaging in some very intense physical altercations with the dead. The moments of hand-to-hand combat are standouts that are rather unique within the subgenre, people in other movies don't usually beat the hell out of zombies with fists, feet and headbutts as much as they do in this film. The Horde is entertaining just because it's a total actionfest for the majority of its running time. It's very simple, I'm not sure why it required four screenwriters. To compare it to a movie that came after, it was very reminiscent to me of The Raid: Redemption (or Dredd) with zombies. A blurb on the cover compares it to Die Hard, and that works too. If you're in the mood for zombie action and mayhem, you could do a lot worse than putting on The Horde. It provides a fun 90 minutes.